Having the mind of a engineer can ruin a funny picture. Sometimes being an engineer can take the fun out of things. If you have the "engineering knack" like me, you have a habit of over analyzing things sometimes. I can rarely pick up anything with a plastic body or housing, such as a remote control or kid's toy, without looking it over to see how it was molded. After being involved in the plastic injection mold making trade, in one capacity or another since 1996, I can't help it. I determine the parting line, look for actions, ejector pin and gate locations, and try to imagine the tooling used to mold the part. The over analyzing plastic parts may be an occupational side effect, but nothing is safe from over thinking from an engineer. Besides obviously all things mechanical, other everyday things are over thought. I have a hard time answering a simple question without going into great detail. I can't even laugh at a funny picture without thinking too much about it. Like this picture a good friend sent me on Facebook this morning, stating the picture reminded her of me. I should have took that as a complement. I should have at least laughed at the picture. But I couldn't do that. I had to critique the concept of roasting marshmallows with a yard rack. There are way too many marshmallows for the number of graham crackers and chocolate. 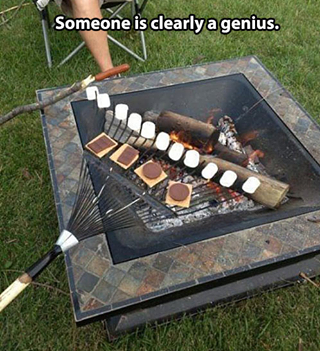 Why are the graham crackers and chocolate on the rake in the first place? Should I be roasting the graham crackers and chocolate? Hey someone else makes s'mores with peanut butter cups besides my family! I wonder if this picture is of a cousin? How would you roast the other side of the marshmallows without dumping the graham crackers and chocolate? Can't get even heat distribution over the span of the rack. Can't rotate and evenly roast each individual marshmallow. Those tangs are going to warp in the heat. They may carburized too. Probably snap off the next time the rake is used.. The paint and God knows what else has touched that rake lately is going to cook into the marshmallows. With the small surface area bearing the weight of the marshmallow and the coefficient of friction of the tangs, those marshmallows are going to fall into the fall before they're done. If one of the center marshmallows caught fire, would it cause a chain reaction? Cant beat a soft wood stick for roasting marshmallows. Why Not Take BOB For A Walk This Weekend?